STUBHUB CENTER – Prince Albert Pagara stopped William 'Chirizo' Gonzalez in the 6th round and captured the vacant WBO intercontinental featherweight crown but not before Gonzalez brought him into deep waters in the main undercard of Pinoy Pride 33 – The Philippines vs The World here in Carson, CA Saturday night. Gonzalez hit Pagara with a right straight to the head seconds after the first round bell but Albert got his bearing and scored with hard lefts and rights himself. 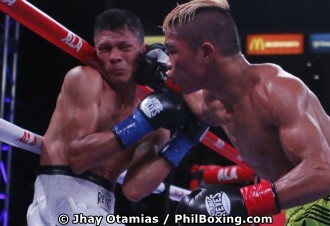 In the second round, Pagara boxed beautifully and dominated Gonzalez with well timed counters scoring with heavy bombs. Pagara sent Gonzalez to the canvas for the first time but threw an extra punch to the head while Gonzalez was sitting on the canvas which got him a point deduction from Referee Jack Reiss. Reiss additionally gave Gonzalez five minutes to recover losing Pagara the opportunity to make a quick follow up. In the third and fourth rounds Gonzalez upped his tempo, throwing combinations that caught Pagara off-guard and himself received some hard hits. Somehow Pagara lost his boxing and stayed in front of Gonzalez throwing hard punches waiting to connect a knockout punch. Gonzalez who was already slowed down from earlier punishment had moments as he cornered Pagara in the ropes. The knockout punch he Pagara was waiting came in the 6th round when he hit Gonzalez with a devastating right straight the sent Gonzalez back reeling towards the ropes. Gonzalez failed to beat the count. Time was 2:20 of the sixth round.